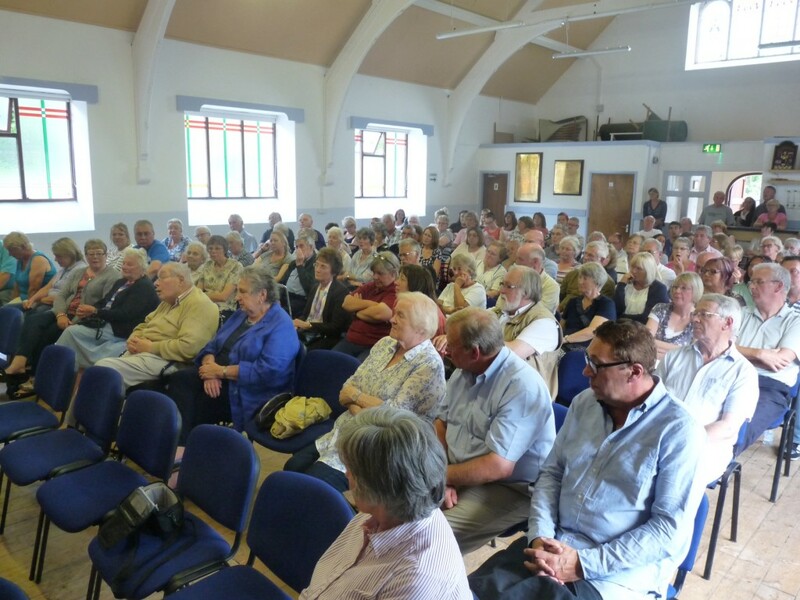 Feelings were running high in Llangoed on Friday evening (03/07/15) for the Public Meeting at the Village Hall, where around 200 turned up to discuss the future of Haulfre. The public meeting followed the decision by the Council Executive on Thursday to go for option 2 which was to go out to consultation which may result in a closure decision in October. Both local Plaid Cymru Seiriol Ward members had urged the Council Executive on Thursday to adopt option 1 which was to invest in the home. The meeting was organised by Plaid Cymru was Cllr Lewis Davies and was supported by fellow Seriol Ward Cllr Carwyn Jones and Assembly Member Rhun ap Iorwerth. 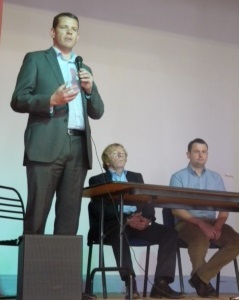 Cllr Davies and all three elected representatives addressed the public meeting and spoke out strongly in favour of carrying out the required works as identified by the Council, noting that Haulfre should remain open until the Council have a strategy and a provision in the area. Senior council officers and the Executive had been invited to the public meeting to explain their vision for older adult care and their decision on Haulfre, however the public were disappointed that they had not turned up to the meeting. The meeting which was well attended and included various stakeholders, including residents, staff, families, Town and Community Councillors, Healthcare professionals along with many Anglesey residents from across the Island. Many comments were made and a number of questions were raised, one lady resident at Haulfre stated, that people are finding it hard to sleep with worry and are crying in their beds all the time. Another resident of Haulfre raised the question whether the Council contacted the Charity Commission because Heulfre was established as the result of a will ‘for charity purposes’? One dismayed family member called for the Council to explain why money set aside for the lift in Haulfre was spend on another care home instead, and went on to ask how can the council justify spending a six figure sum on repairing the Haulfre clock but not agree to spend money on the home itself? Much dismay was aired from the floor regarding why have the health and safety and fire problems not been dealt with over the years by the Authority and what was the minimum amount that needed to be spent on the building? Worryingly healthcare professionals noted they have been unable to refer patients to Haulfre for months, which astounded many as there are 6 unoccupied rooms at the home. Following the address, the public raised a number of questions which have been put in writing to the Council CEO Dr Gwynne Jones and Director of Social Services Mrs Gwen Carrington to respond within two weeks.